What’s the old saying I scream, you scream we all scream for the Letter “I”, isn’t that the old saying? The Blogging A to Z Challenge is especially fun because, I’m going to talk about ice cream and one of my favorite places, Ice Cream Kids. Ice Cream Kids is a wonderful shop in our town of National Park. The building used to be a service station many years ago. The shop is owned by a great guy named Bill who I’ve known since kindergarten! He has the nerve to not look much different from how he looked in high school. Anyway, what’s really great is that he has two businesses in the building, Ice Cream Kids and a propane business. His two businesses keep him working year round. That’s the big logo inside the store. Those of you who have read BCDC for awhile have seen that before. 😉 That’s actually Bill, the owner sitting there at the counter. This is usually Ralph’s choice when we go…The Banana Boat. Too much “stuff” for me. I’m simpler with my choices. This is a combo of coffee ice cream on top, butter almond on the bottom. I think this is my favorite. One of my other favorites is rum raisin. Do you think I enjoyed it?! All Gone!! 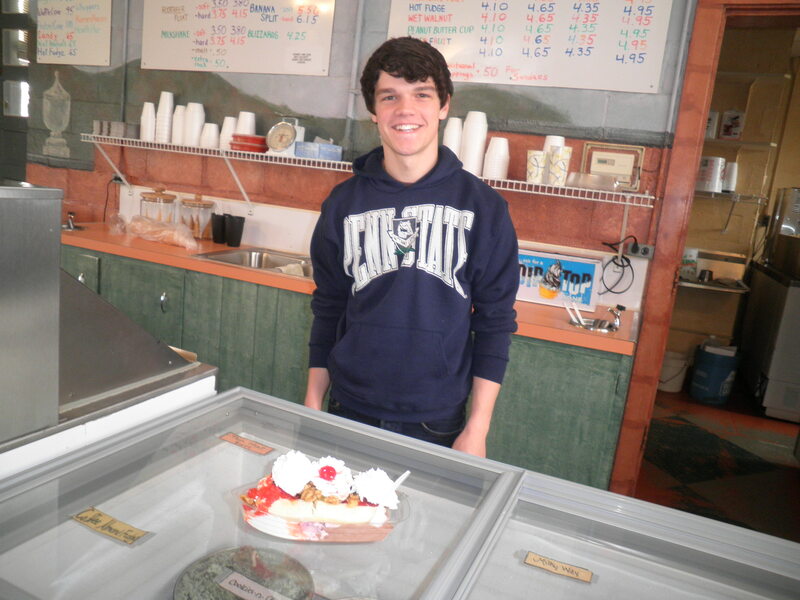 One of the best things about Ice Cream Kids is the young people who Bill hires to work there. They are all so nice. This is Dominic with his great banana boat creation. 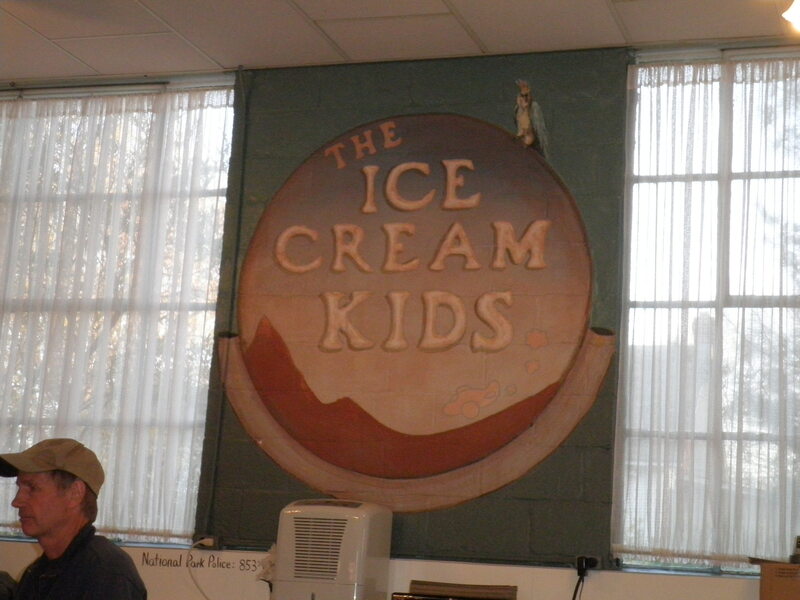 Each and every one of the “Ice Cream Kids” is pleasant and polite and they make it a pleasure to visit there. In fact, there’s supposed to be an afternoon visit to Ice Cream Kids today. I will be going but I will not be participating. Too much Easter candy for me. I’ve got to draw the line somewhere. 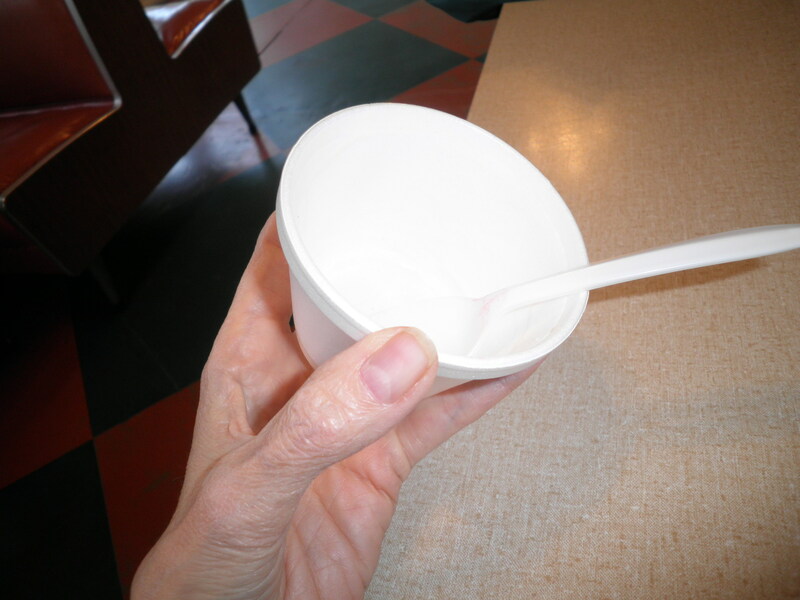 But trust me, if there’s a visit to Ice Cream Kids next weekend…I’ll be eating my share! Happy Tuesday! Go eat some Ice Cream…at Ice Cream Kids!! This entry was posted in Uncategorized and tagged Blogging A to Z, ice cream, Urbanspoon. Bookmark the permalink. what a neat spot! i wish i could join you. 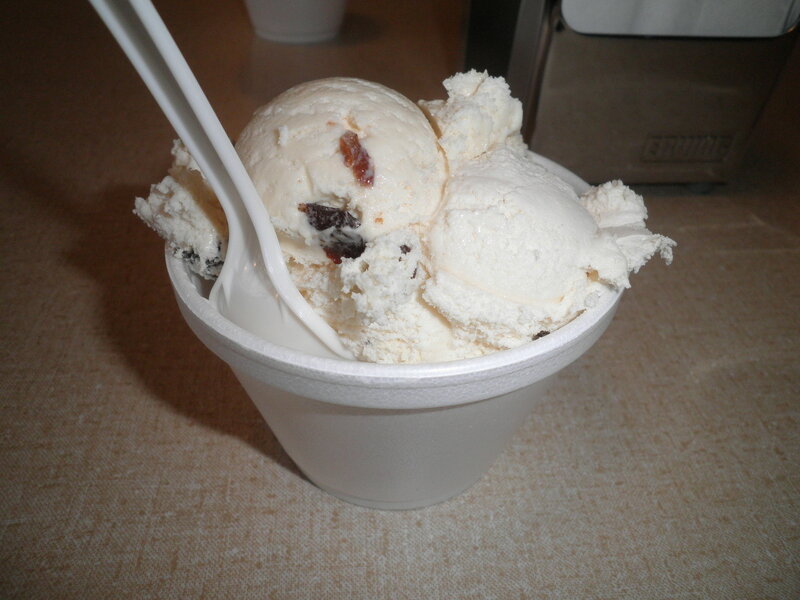 i would order chocolate chip, that is only what i ever order at ice cream shops – yum!! it sounds like such a cool spot – both for the ice cream and the atmosphere. enjoy your outing today – maybe you will at least get a bite?!! i am with you – i don’t like too much “stuff” on my ice cream!! but sprinkles are ok! Cathy, it is the coolest place. We took my little nephew. He loved it. I was good and did NOT have any! Arrived here via the Challenge and left here hungry! Great post! I’ll be back. Hi, Jayne! Thanks for stopping by, please come back anytime! I love ice-cream and this place looks fabulous! 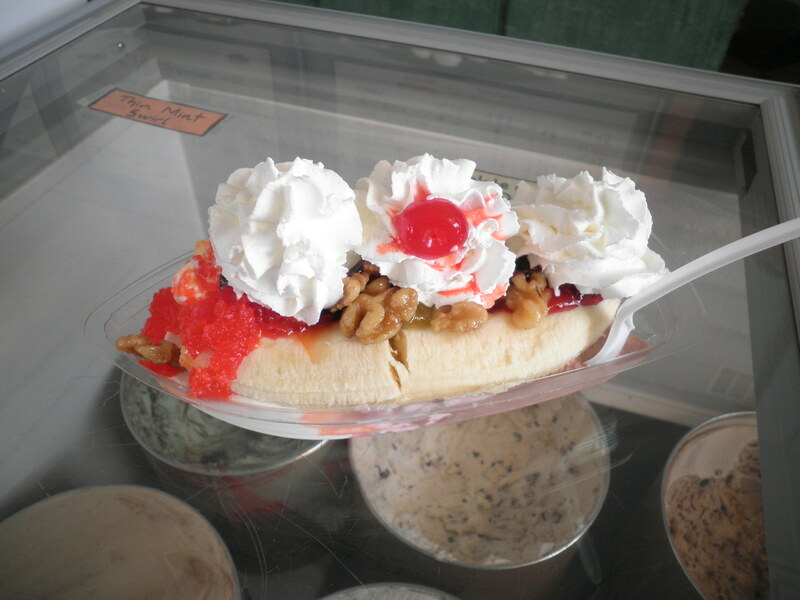 There’s an ice-cream farm near where I grew up and I still love going there. I think rum & raisin has to be my all-time favourite flavour. Hi Sarah! Rum raisin is one of my favorites!! Ice cream is my very most favorite treat ever. I like lots of nuts and maybe a warm waffle cone on the side. Nice employees are a must, it makes the whole experience so much more fun. Ice cream is my very most favorite dessert ever. I like lots of mix ins, especially nuts and granola and oreo cookies (w/out the creme filling) and maybe a warm waffle cone on the side. NIce employees are a must, it makes the whole experience so much more fun. Hi Marie! Glad that Brutus could accompany you today! This place has the best ice cream. Your gang would love it! Hi Lisa!! It’s well worth the Points I have to give it on Weight Watchers! Thanks for stopping by! This reminds me of Bob’s Famous- an ice cream chain that used to be in Washington, DC. I worked there for a while, and all the ice cream was homemade and the flavors were amazing. There is nothing like real ice cream. Hey, Melonie! This place though not home made, had wonderful quality ice cream! I approve of your taste in ice cream! 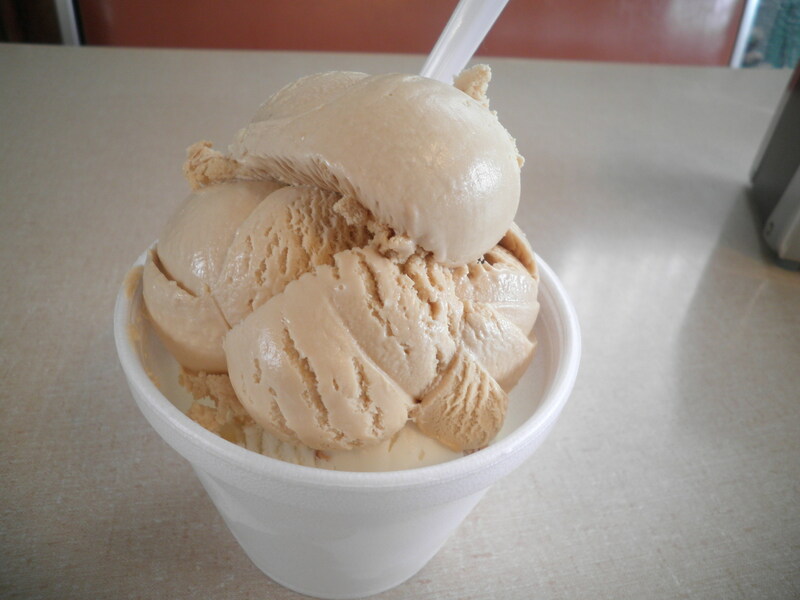 Coffee ice cream was always one of my favorites–which oddly no one makes in dairy free, although there are vegan ice creams available in almost every other flavor out there (rum raisin included!). Too cool that you got your custom flavor! Poor thing…I’ll keep on the look out for it for you! Not trying to tempt you, Zo! It’s such a fun place to go. With the warm weather I think they actually opened early. I have to be Very careful!! I love the banana boat. Wish I could eat some of that now. Hi Asmita! Thanks for stopping by! You’re with my husband then, he loves all the gooey goodness!